Ingvar Kamprad founded IKEA in Sweden back in 1943 at the tender age of 17. By the time he died in 2018, he had been listed by Forbes as one of the ten richest people in the world. Not bad for a man whose company never strayed far from selling ready-to-assemble furniture, kitchen appliances and home accessories! There were many things that made Ingvar Kamprad (pictured above in his office) and IKEA great. The stand out for us at IKD is his continual focus on design and development. Yes, it’s not just the great IKEA kitchen designs that we love! Kamprad’s dedication to design and development inspires us every day. From product design to company structure to business development. The whole package. If there’s one thing that Ingvar Kamprad taught us here at IKD, it is how things can always be better whether that’s in terms of function, scope or design implementation. Retro IKEA kitchen Love in! To mark the passing of Ingvar Kamprad, who has surely done more for the ready-to-assemble kitchen furniture crowd than any one else, we went flicking through some of those old IKEA catalogues to check out just how the company’s commitment to design and development has impacted those stunning IKEA kitchen designs over the years. The first IKEA decade that really stands out for us at Inspired Kitchen Design, is the 60s! We love IKEA’s Nordic emphasis on minimalistic, stylish cabinetry in the era of the Free Love, The Stone, The Beatles and, hey, Sweden’s very own Hep stars. Still, all that 60’s IKEA minimalism wouldn’t really work today unless you were on a minimalist kick maybe coinciding with a clean eating fetish! 1966’s IKEA catalogue shows hard, uncomfortable looking chairs! And very, very small tables. There’s barely room for little more than some of that famous Swedish crisp bread. By 1977, we’re sure the IKEA gang must have been rocking that ABBA-vibe, possibly hot pants and all. But from the kitchen in the catalogue it looks like teeny-weenie chairs and kitchen tables are still á la mode. The big change here is how Kamprad & Co let vibrant color do the talking. Who can miss a bright red cherry kitchen remodel, right ? Your friends wouldn’t fail to notice if you upgraded your kitchen design to such a far out color in 2018, would they? But as IKEA’s current rage of cabinetry doesn’t include anything as, er, exotic, you’d have to get some custom cabinets made. As a point of interest – well, to us kitchen design geeks that is – note that the 70’s IKEA kitchen shown puts the focus on storage options beneath the countertop. Very useful, we’re sure, for showcasing the Danish pottery you inherited from your ageing aunt! But not very good if you hadn’t remodelled your kitchen by the time the 80s came around what with needing room for new appliances like microwaves and dishwashers. By 1981, the cover of the IKEA catalogue from that year really demonstrates just how far the company has come in its adherence to simple, stylish urban quality kitchen design. The white kitchen cabinets look sleek and functional with plenty of storage space. No doubt this style went down well in kitchens around the world from Hägersten in Sweden to Houston, USA! This was the first time in 18 years that IKEA put kitchen cabinets on the cover. So you can tell that they were proud of them. Looking at the cabinet models with modern eyes, they look positively retro now; but back in the day this was functional storage space for those with a eye for Scandinavian kitchen design. And they sold like hot cakes ! 1997 saw the introduction of IKEA 365+ ! IKEA 365+ was a range of functional, attractive everyday products for preparing, cooking, serving and eating food. “The products were designed to make kitchen work easier and more enjoyable, at the same time bringing a little more beauty into everyday life with their form and colours”, according to IKEA. 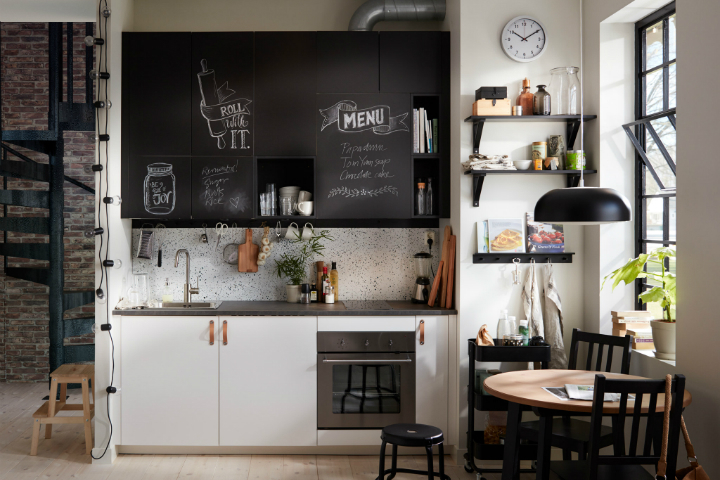 Just two years later IKEA launched VÄRDE kitchen, which was a new way of thinking about kitchens. Its unique modular design allowed customers to create an entire kitchen from scratch or simply add a piece here or there. As the advertising execs put it: “The innovative design, functionality, ergonomics, ecological compatibility and durability” helped VÄRDE win the Red Dot Award for Highest Design Quality, organised by Design Zentrum Nordrhein Westfalen in Germany. 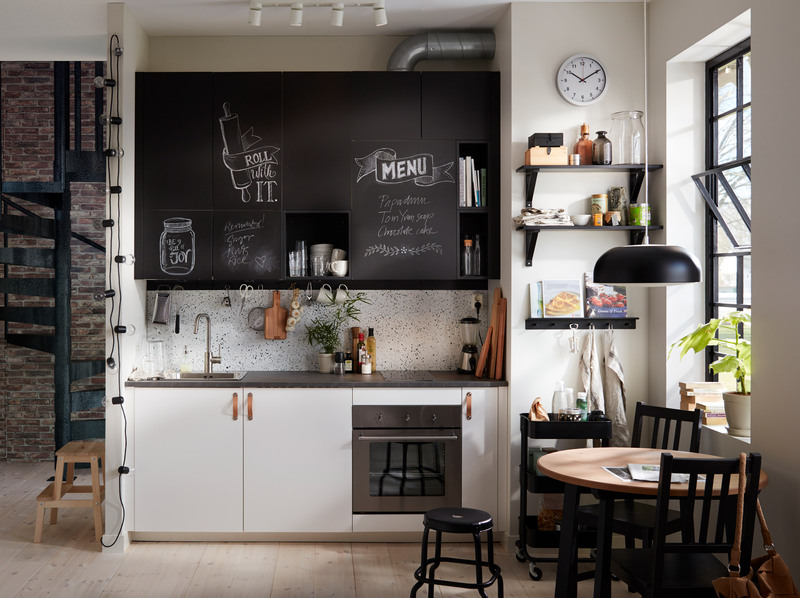 The modern IKEA kitchen retains much of the same attention to design, form and function as IKEA kitchens from the previous decades, but the styles are different, reflecting modern trends. The consumer has changed too. Nowadays consumers aren’t just settling for a big box, self-assemble IKEA kitchens. They want more! 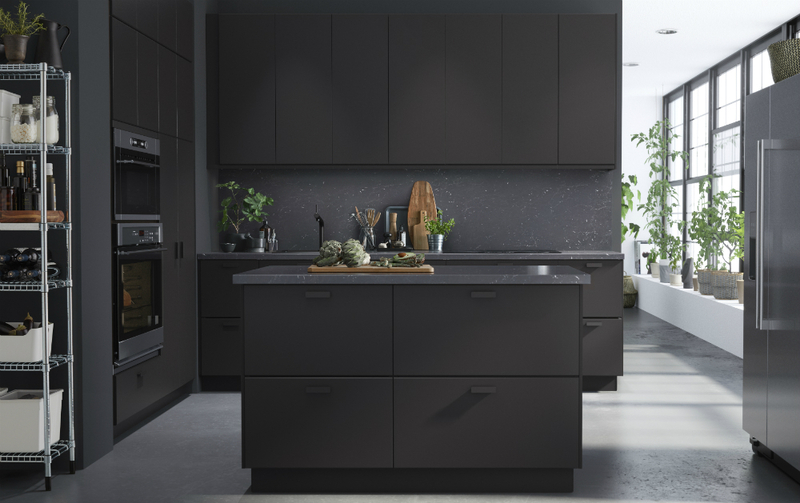 A whole industry of kitchen designs and kitchen installers has evolved to help turn the Swedish furniture giant’s products into the basis for truly stunning, custom designed kitchens. 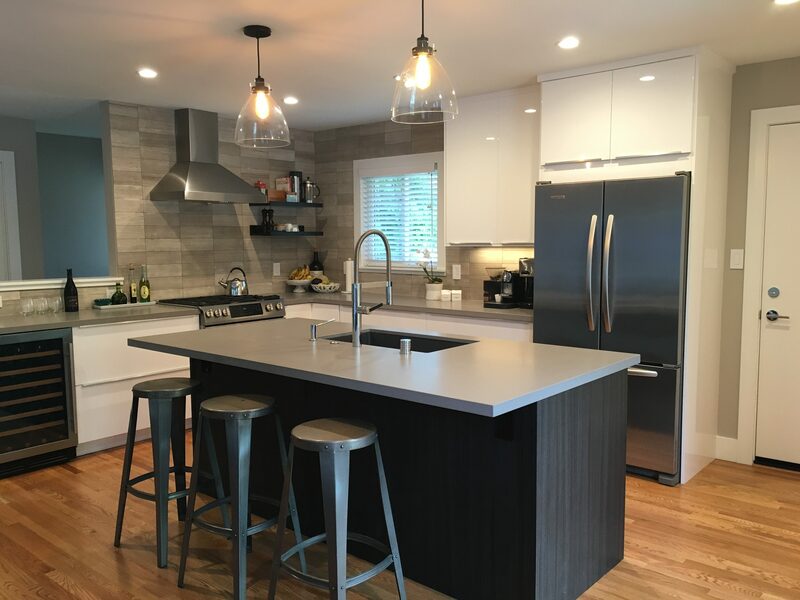 Here at IKD we’ve seen more and more customers looking for ways to liven up the showroom kitchen with custom cabinet doors or quartz countertops. We’re also seeing more ambitious attempts to do something different with kitchen layout, as architecture changes. For example, more and more new build homes have increasing amounts of window space. There’s an emphasis in welcoming natural light into the home. As kitchen designers, that means rising to the challenge of crafting the space to accommodate sufficient storage options. After all, natural light is great but you still need place for appliances and storage. It goes without saying that we’re grateful to Ingvar Kamprad for starting and building such a great company! It’s been exciting to see how the company and kitchen products have evolved over the years. 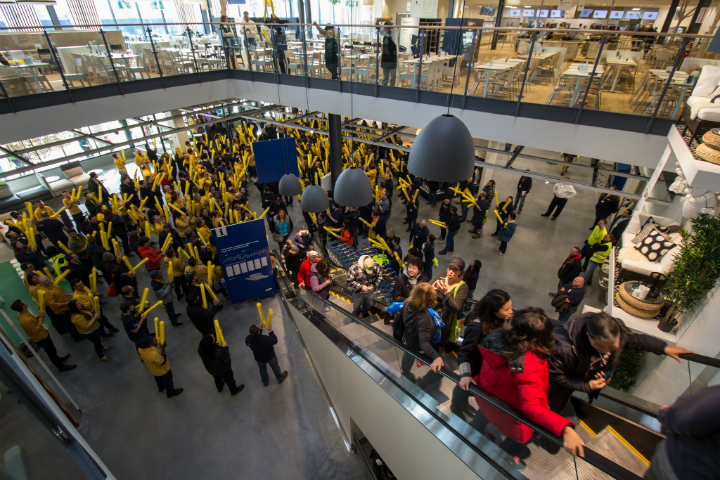 He resigned from the Board of IKEA in June 2013 and those that have followed have continued to take the company forward to even more success. Here at IKD, we’re sure that no matter where Ingvar is today, whether it’s the intergalactic kitchen showroom in the sky or behind the pearly gates, he’d be storing his pots and pans, ready to cook up some juicy Swedish meat balls in some swank, custom designed IKEA kitchen. And if you’re reading this Ingvar, just let us know! Your custom kitchen design is on the house ! The word amongst consumers on Houzz is that IKEA’s next kitchen sale is coming in February/March in the US. Who’s the source of this juicy rumor, you ask? None other than an “IKEA kitchen guy.” Sounds really credible, doesn’t it! The thing is, IKEA are notoriously tight-lipped when it comes to revealing the dates of upcoming sales. Believe me, we try and get a wink or a nod from our local IKEA store in Miami, but nothing ever gives. Zip. Zilch. Nada. So that’s why we’re taking Mr IKEA Guy’s prediction with a hefty pinch of salt. 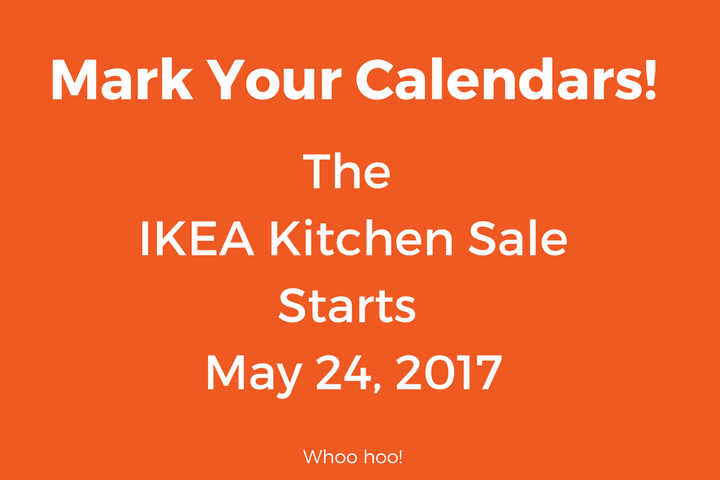 If we had to guess when the first IKEA kitchen sale of 2018 will happen, we’d put our money on March. If we’re right, it would run until after the Easter weekend (as IKEA sales last 30-45 days). Before the introduction of the SEKTION line, you may remember the discount being 20%. In recent years, however, there’s only been a discount of 15% — on all lines. With smaller savings to be made, make sure you’ve got everything ready. You want to place your order as soon as they announce the sale. Because products quickly sell out, any delay in ordering could cost you money. We know from experience that some of the most popular products sell out extremely quickly. 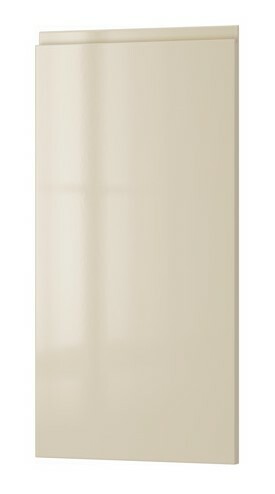 For example, last year everyone wanted BODBYN cabinet doors in white. They were like gold dust. We were hearing that they had sold out in our local Miami store quicker than you can say “Mine’s an Ekestad door, please”. Remember, having your design in hand and ready to go will be your secret weapon to making the most out of the IKEA sale… whenever it happens. If you’re doing your kitchen redesign alone, that means you’ll have the pleasure of dealing with the Home Planner. If the sale is rumored to be in March (emphasis on rumored), you need to get your head around the Home Planner pretty soon. For those of you who don’t already know, the Home Planner is not the easiest of programs if you’ve never worked with it before. Of course, we do know a few couples who’ve managed it – and not filed for divorce! Another option, of course, is tok go into your local store and see if IKEA staff can help you. This works for some folks. You’ll find that most of the staff are proficient and well-trained in the program. The problem? The majority of the in-store sales staff simply haven’t had any real-world design or construction experience. So what does this mean for you? Quite frankly, they might not be able to answer all of your questions. Say you need them to show you how the cabinets should be placed if you’re ripping down a wall for a major kitchen remodel. You might get lucky… or you might get a blank stare for an answer. From talking to our customers who have gone the IKEA staff route, we suspect they’re pretty much only trained to update your existing cabinets with minor variation. Here’s where we come in! The average customer might only use IKEA’s Home Planner once in their lives. But at IKD, we’re specialists at working with the Home Planner. We’re also professional kitchen designers. We see solutions to the problems and questions you have. Heck, we’ve been able to design kitchens that IKEA saw and flat-out said they couldn’t! Making sure you get the very best kitchen design isn’t all we do, of course. We also make sure your order is ready to go, with everything you need to place your order. And, yes, that includes making sure you’re not missing finish panels, moldings, toe-kicks and fillers needed to assemble your IKEA kitchen. The bottom line is that you can’t predict IKEA’s next kitchen sale in 2018. Though the rumors suggest February or March, we’ve seen it come in April before. There will be a sale — quite probably — at the end of the summer… but I wouldn’t bet my house on it. My advice? If I were you, I’d get that kitchen design finished as soon as possible. Make sure you know exactly what you want, where every appliance is to be positioned and then bide your time, calm in the knowledge that you’re good to go when the sale is announced. Well here we are, almost two weeks into the new year. Did you put “get a new IKEA kitchen” on your list of new year’s resolutions? If you want a kitchen that’s both trendy-savvy and timeless, this is the post for you. So what kitchen trends can we look forward to in 2018? Put away your tarot cards, tea leaves, and crystal ball, dear readers! I’ve got all the intel you need — plus a few of our IKEA kitchens that were ahead of the curve. Two-tone cabinets are a great way to keep your kitchen from looking too “matchy-matchy.” Never fear: you can still have your little white IKEA kitchen! In fact, we’re quite fond of using white for upper cabinets, and another color for floor-level cabinets. 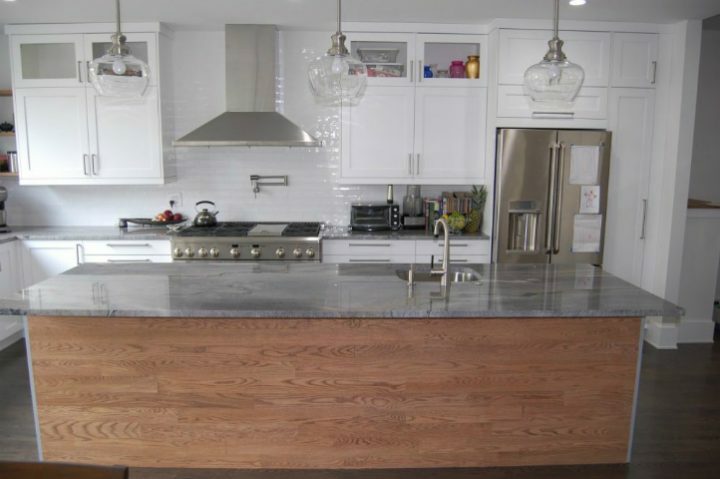 As you can see, Stacey chose gray to complement her white cabinets. Tina, on the other hand, mixed it up with walnut doors. Even if you’re loyal to entirely one color for your cabinets, you can still live that contrast life. Just remember Star Wars: keep your light and dark in balance. The “odd couple” offset the high-gloss white cabinets with dark countertops and a gorgeous wood floor. Down in Bermuda, Catherine used the same technique to dramatic effect. Unless you’re designing a block of apartment buildings, you probably don’t want a cookie-cutter kitchen. Little personalized touches are an excellent way to make your kitchen truly “yours.” In 2018, those quirks are decidedly in. From the waist up, Kevin and Ellie’s kitchen might seem like a standard (albeit gorgeous) white kitchen. So what takes this kitchen from “gorgeous” to “breathtaking” (if I do say so myself)? The floor tile. Fun fact: DIY champion Kevin also custom built the crown moulding. During a 7-week Italy trip, Chris and Jennie fell in love with with a Sicilian kitchen. Specifically, the tile. After lots of hunting, they discovered Cement Tile Shop. Just take a look at the gorgeous, patchwork backsplash tile they used! Your kitchen should reflect you, not just your Pinterest board. Where have you been, and what have you seen, that’s inspired you? Find a way to work more of “you” into your design. You hear about this a lot in fashion. If you’re rocking a leather skirt, pair it with cashmere or cotton up top. Soften dark denim with a hint of lace. You get the idea. But how does this translate to kitchens? Well, just take a look at Georgia and Nick’s backsplash. It’s white, just like the cabinets, but it commands my attention. (The under cabinet and hood lighting help here, too) Texture is a great way to add some variety without using more than one color. ICYMI: the Pantone color of 2018 is “Ultra Violet.” Those of you who you share a purple obsession with Marie Schrader from Breaking Bad are in luck. For the rest of us, take heart: other deep colors, like blues and greens, stand to play a big role too. One of my favorite examples from the past year? Beth’s beautiful blue backsplash. When I look at that, I just think “Ahhhhh.” It’s an oasis of rich blue in the midst of whites, grays, and other neutrals. Think about how to incorporate deep colors into your kitchen design! Maybe that’s why so many IKD customers are searching for clever storage solutions. Small kitchen, big kitchen, oddly-shaped kitchen — we all need plenty of storage. And speaking of small kitchens: you can’t beat Amy and Derek’s kitchen in terms of unique storage. Can you spot the hidden storage secrets? Secret #1: an appliance garage hides behind a roll-top door. Secret #2: score some extra counter space by using a fold-down cover over the range top! Hopefully, you can put off renting a storage unit for another year. You’re welcome. Alas, my crystal ball has moved on. What do you think, readers? Will any of these trends make an appearance in your kitchen in 2018? Have you seen other trends you want to work into your kitchen design? Let me know in the comments! Our designers are always happy to work with you to create the IKEA kitchen of your dreams. You can get started today! After all: spring cleaning is just around the corner, but there’s not much to clean in a brand-new kitchen. The 2018 IKEA catalog finally dropped last week and we are so excited! Two weeks ago we reported on the new ÖSTERNÄS leather pull handles and the PINNARP countertop. But with the new catalog, there are new items and new prices for every room in your home. Naturally we’re here to tell you all about what’s new in IKEA kitchens. Let’s start with the new doors! IKEA comes out with a new catalog each year and if you’re like us, you eagerly await that thick volume in your mailbox every fall. And if you’re really like us, you get pretty excited when IKEA announces new interim products, too! This August IKEA has 2 new items coming to their kitchen offerings: a new countertop and new door handles. You can’t purchase them until after August 7th, but nobody’s stopping you from getting giddy over these photos. We’ve written about the quirks, pitfalls, and problems many people have trying to use the IKEA Home Planner to design their kitchens by themselves. Without a design, you can’t buy an IKEA kitchen. But using the Home Planner to design your IKEA kitchen can drive you mad. If you’ve ever typed “I can’t get the IKEA Home Planner to work!” into Google, you’ll discover that IKEA offers an add-on service for kitchen measuring and planning. For a starting price of $199, IKEA will come out to your home, take your kitchen measurements, and design your kitchen in the Home Planner. Sounds great, right? Maybe even heaven-sent? Then why was IKEA customer Dainius so disappointed in the subcontractor IKEA sent to plan his kitchen? IKD customers are savvy and in the know about good design choices. That’s why so many of them seek out custom cabinet doors from Kokeena. Kokeena in Oregon has a bevy of beautiful cabinet door options that make your kitchen look unique and stylish. This week I interviewed Russell Edwards, the CEO of Kokeena. Kokeena is based in the greater Portland area and services both Canada and the United States. Why do your clients choose custom doors rather than IKEA doors? Which of your options are the most popular? Our customers are looking for something more unique, but also budget-friendly. Often they don’t care for the IKEA door styles, but can tell that the interiors are good. That’s where we come in. Many customers don’t want a ‘off the shelf’ look. Last week we shared on our Facebook page that IKEA was coming out with a new door style made from recycled plastic bottles and recycled wood. (You do follow us on Facebook, right?) And as of today you can buy them at IKEA! They’re called KUNGSBACKA and are officially listed on the IKEA website. Here’s everything you need to know. Ah, European kitchens. They’re so sleek and stylish we can’t blame any of our customers for wanting that look. We encourage it! 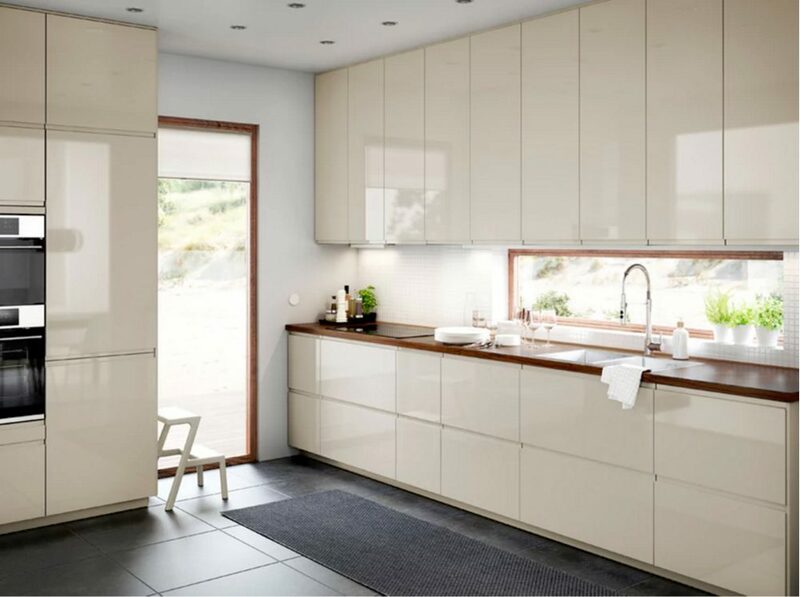 IKEA is an affordable, flexible option for getting a European style kitchen in North America. 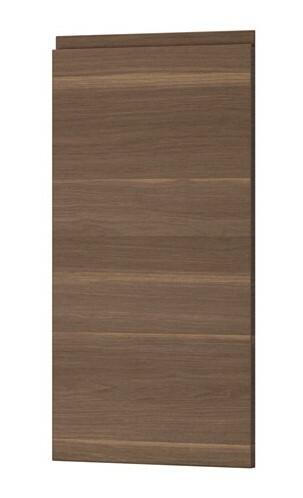 Their latest addition, VOXTORP doors for kitchen cabinets and drawers, gives us 3 more options for a European look. They’re flat panel. European kitchens are all about the clean lines. They have integrated handles. The asymetrical grooves are subtle and functional. VOXTORP doors have been on the IKEA kitchen scene for a good 6 months now. We’ve designed several kitchens with them. We’ve learned there are 3 important things you need to know if you’re thinking of using VOXTORP doors because they could thwart your attempt for a European-looking IKEA kitchen. We also discovered a glitch in the Home Planner and an error on the IKEA website for this door. 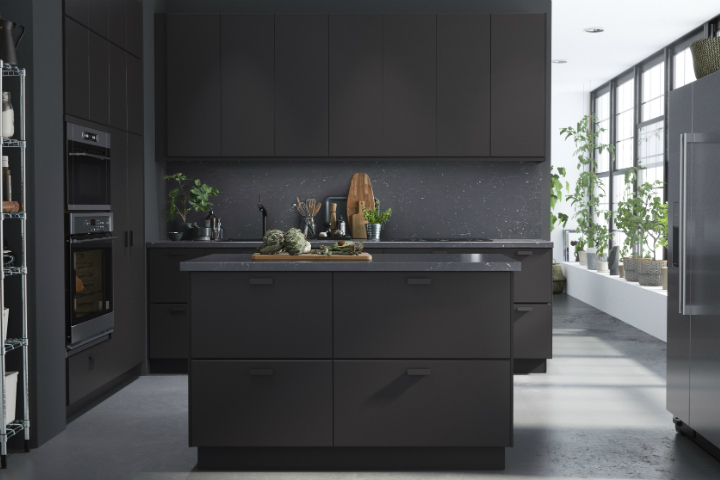 More and more, IKD customers are choosing IKEA for their kitchen cabinet boxes and sourcing their doors, appliances, and countertops from somewhere else. Why? Because they want a custom-looking kitchen. 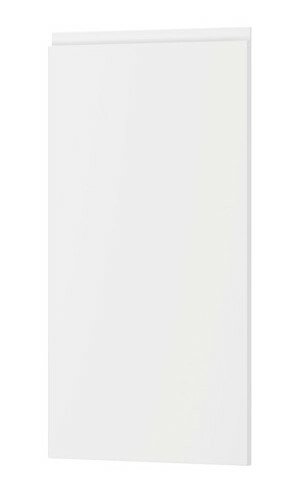 AllStyle Cabinet Doors in Canada is a popular supplier of IKEA retrofit solutions. When you buy their highly stylized, beautiful doors, your kitchen will look anything but IKEA. This week I interviewed Drew Gall, the President of AllStyle. AllStyle is based in the greater Toronto area and services both Canada and the United States. It’s often said the kitchen is the heart of the home, and we tend to agree. But we’ll take the metaphor further to contend the kitchen table is the unofficial headquarters of the home. It’s where we work, play, gather, collect, organize, relax–oh, and eat, as well! Here are a few highlights for daily dining that may make your wish list as you plan your kitchen remodeling project. Need ideas on how to blend your kitchen’s cooking and dining areas into a space that’s totally “you” and true to your family’s needs? We’re here and ready to help; just contact us anytime to get started on your IKEA kitchen design.